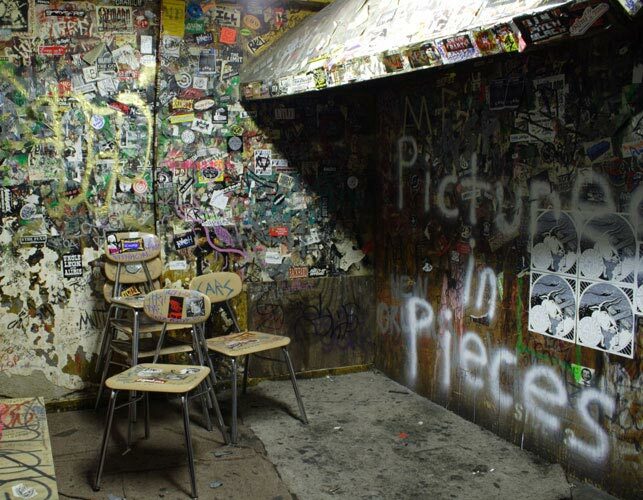 CBGB, the music club that helped define New York City’s “punk” scene by introducing the world to such bands as the Talking Heads and Ramones, is little more than a bar, a stage and two bathrooms. Since the club opened in 1973, very little has changed about the physical space, with one exception: the graffiti. The club has never stopped its patrons from adding to the mosaics of ink and pencil that literally cover every square inch of the club’s walls. As grimy and layered with ink as they are, the walls contain the history of the club, from the musicians to the fans.